Though technically a separate country, a quick trip to Uruguay is a must for visitors spending any length of time in Argentina. Those staying long-term in Buenos Aires are forced to make a pilgrimage every three months over the border in order to renew their visas. And considering the proximity, even people just visiting for a few days can take a day trip over to Colonia, returning to Buenos Aires in time for a tango dinner show or a night out with friends. 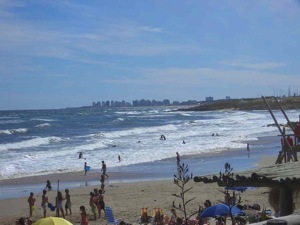 All this to and fro between the neighboring countries is made possible by the efficient and modern Buquebus, a collection of ferries and buses connecting Buenos Aires with Uruguay’s three main coastal destinations, Colonia, Montevideo and Punta del Este. In general, Uruguay is a greener, quieter version of Argentina. The streets are less crowded, the buses less noisy, the general pace of life a bit more tranquilo. Colonia del Sacramento is the nearest destination and Buquebus organizes day trips, complete with return ferry, lunch and a city tour. Colonia is a quaint harbor town with winding cobblestone streets and ruins of historical buildings. In fact Colonia’s historical district was even named a world heritage site by UNESCO. Most of Buquebus’s ferries connect with Colonia so if you can, arrange to spend a few hours leisurely exploring the town. Next on the Uruguay hit list is the countries modern capital Montevideo. Almost 45% of the Uruguayan population lives in Montevideo, and why not, it was recently ranked the city in Latin America with the highest standard of living. Montevideo may seem to be lacking the pizzazz of Buenos Aires, but if you take the time to look the city is filled with culture and interesting sights not to mention the inviting strip of white beach running the length of the city. Buquebus has three ferries every day that go straight to Montevideo, or a less expensive option is to take the ferry to Colonia and connect with a bus from there. 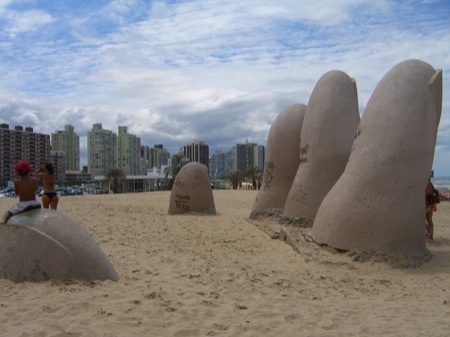 For those in search of a beach holiday nothing beats Punta del Este, the trendy beach destination that is putting Uruguay on the map. With endless beachfront, glitzy resorts and fashionable nightlife, this stretch of peninsula is Uruguay’s up and coming claim to fame. During the summer months the hotels are full and the beaches are packed with international clientele. Downtown is relaxed and family friendly, while La Barra, a strip several kilometers north of the center, caters to the young and the beautiful. There is surf for everyone and several schools and board rental shops for those willing to learn. Aside from the beaches young people flock here for the wild nightlife, beach parties rage into the morning and elite uber-chic clubs turn away all but the most beautiful. Punta’s popularity is exploding and hotel reservations for Christmas through January should be made well in advance. But aside from the summer months the city is quiet and many places completely shut down. There are no ferries that go all the way to Punta, but Buquebus has services connecting buses with ferries to Colonia or Montevideo. Buquebus has a sort of monopoly on ferries to Uruguay, but their prices are mostly reasonable and service reliable. There are over ten ferries a day, some rapid and some much cheaper and much slower. 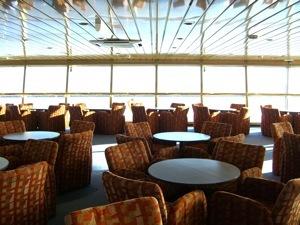 All ferries to Colonia have a seamless connection with onward buses to Punta and Montevideo, even the night ferry that leaves at 12:30 am. 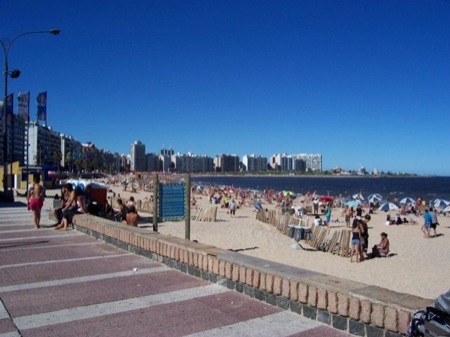 Buquebus can also arrange hotels and activities for your trip Uruguay, and they often have special deals and discounts so be sure to ask before you book. The buquebus website has all the information you need to plan your adventure, or you can stop into one of their offices.